Sierra Building's roof systems combine the aesthetics of an architectural panel with the strength and endurance of a structural panel. All panels undergo extensive testing to earn a number of UL and FM uplift ratings to ensure reliability and performance. Superior weathertight- ness and long-term warranty programs for Sierra Building's panel systems provide protection and peace of mind to our customers. Ultra-dek is a trapezoidal solution that provides optimal durability and weathertightness. This panel carries air leakage and water penetration testing approvals. It features an interlocking snap seam to support a faster, easier installation and a more efficient erection process. The system is available in the standard 24" width with 12", 18" and custom sizes available upon request. The double-Lok panel is an ideal roofing system to endure high- force winds. This mechanically-field seamed, trapezoidal leg standing seam system is equipped with a concealed fastening system. It is available in the standard 24" width with 12" and 18" available upon request. SuperLok is a mechanically field-seamed, vertical leg standing seam that combines a slim rib with exceptional uplift resistance. It’s ideal for tolerating even the most rigorous weather conditions. It is available in standard widths of 12" and 16" and is designed for roof slopes of 1/2:12 or greater. BattenLok HS is a mechanically field-seamed system that can be installed directly over purlins or bar joists and is capable of transitioning from roof to fascia applications. This system does not require a solid substructure for support; ideal for functionality with a wide array of coating options. 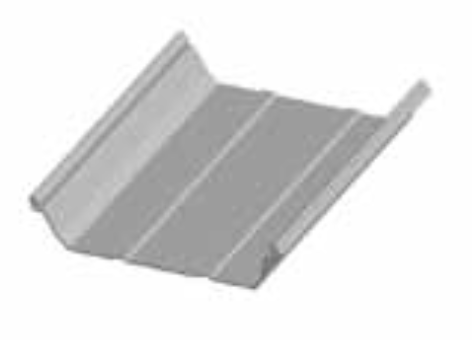 It is available in standard widths of 12" and 16" and is designed for roof slopes of 1/2:12 or greater.